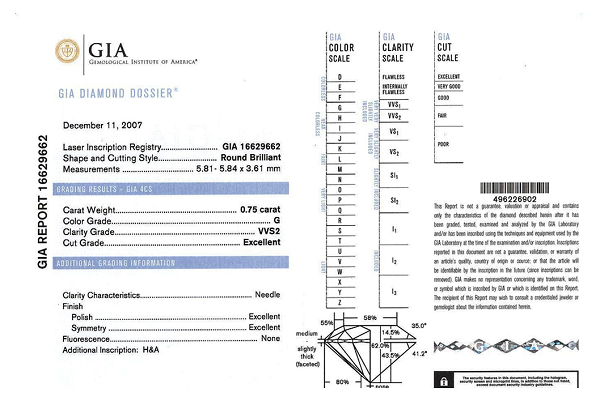 Each diamond sold by a serious trader must be equipped with a certificate issued by an internationally accredited gemmological laboratory. 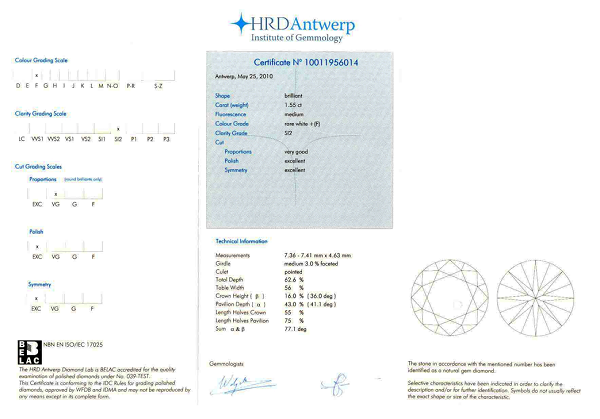 The certificate guarantees the quality and authenticity of the diamond to its holder. 1) HRD Institute of Gemmology (Hooge Raad voor Diamant) from Belgium. It is one of the most reputable gemological laboratories. It was founded in 1973 and strictly adheres to the rules stated by the Diamond High Council. 2) Gemological Institute of America (GIA) - it was founded in 1931and belongs to the absolute top among the gemological laboratories all around the world. It adheres to the rules set by the Diamond High Council in full extent. 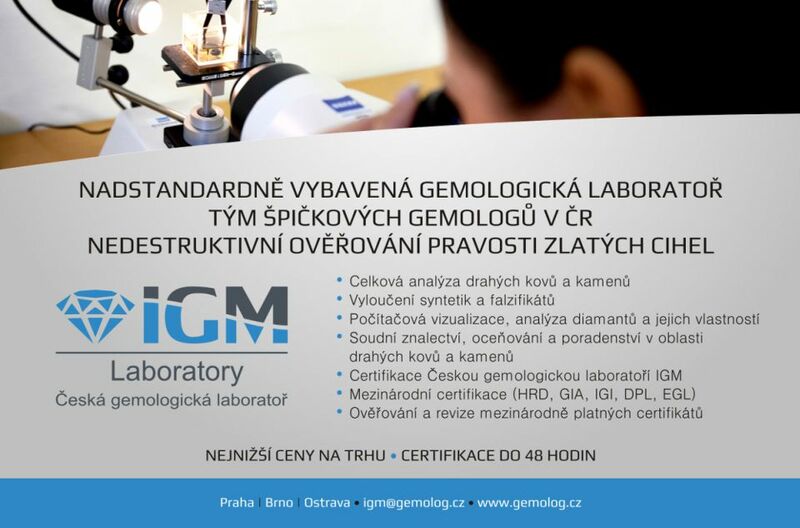 3) IGI International Gemmological Institute - it was founded in 1975 and it constitutes with its 17 branche offices all around the world the world's largest independent gemological laboratory for testing and evaluating of gemstones and jewelry. 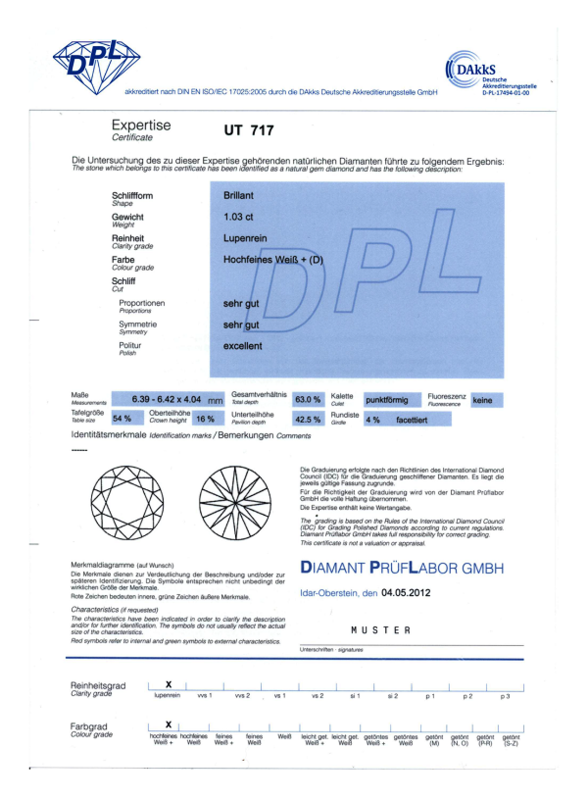 4) Diamant Prüflabor GmbH (DPL) - based in Idar-Oberstein is a leading German gemological laboratory complying with the strictest requirements in the evaluation of diamonds. It was founded in 1975 and in 2002 it was accredited by DAkkS German Institute for Accreditation, Berlin, as a laboratory, conducting legitimate grading in the field of cut and rough diamonds. 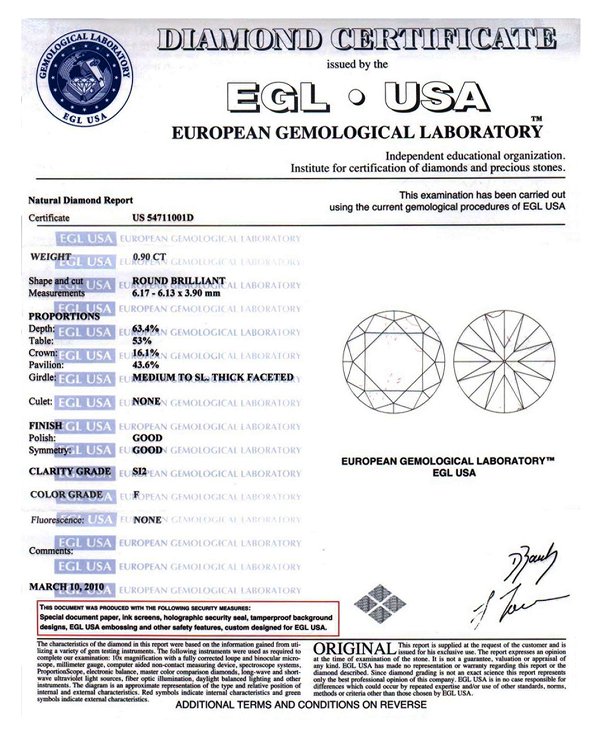 5) European Gemmological Laboratory (EGL) - a leading laboratory in the world and first in Europe, it was established in 1974 in Antwerp, Belgium. The company was founded by Guy Margel, the president of E.G.L. International and a world expert in the field of diamonds. E.G.L. 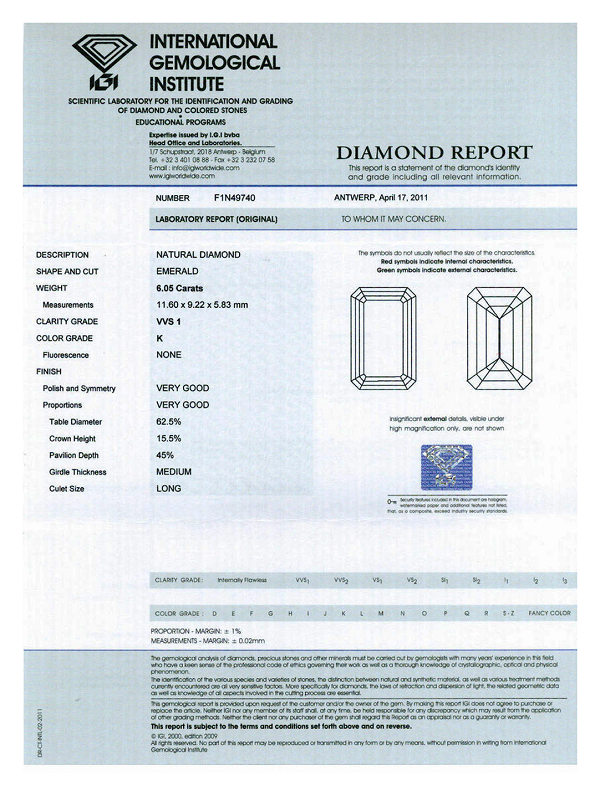 International has its laboratories worldwide and services so the largest markets with diamonds. EGL certificates are recognized around the globe for their accuracy and integrity, defining industry standards in evaluation and appraisal. The company maintains a worldwide presence in the major diamond trading centers, cooperates with leading organizations including the World Federation of Diamond Bourses and runs an extensive educational program as part of its dedication to protecting public interest and raising the level of professionalism in the field.